The peacock and starling, the starling and herl, the starling and yellow, and there must be a few more names for this fly. In Nemes book The Soft-Hackled Fly he mentions this fly with his ingredient list. The items listed a quite sparse..peacock body and starling feather. The fly I tie is about as sparse as far as materials needed, but I choose a body of thread, a peacock herl thorax and a starling feather. What I would like to show here is the color variations of the yellow thread body. As you see from the first photo the thread used is bright yellow. Through the next few photos I'll show how simple thread can change the body color of the fly. This is the fly with 2 winds of the yellow thread for the body. It appears to have a greenish tone. Here is that same fly against a different back ground and the body takes on an olive tone. Here is that same fly when wet...yet another color variation. Now one would think that the difference would not mean a whole lot...but it did. So with a few turns of thread, a turn or two of peacock and a tiny starling feather you can tie this simple pattern. On one of those cool mornings we experienced last week I found myself checking a couple of small streams. With the tough summer here in the northeast I was not certain what I would find. Both of the streams hold good populations of brook trout and in the past they have given up a few surprises. While walking in to the first stream I was happy to see water flowing and in some locations deep pools. The stream is in deep forest with plenty of hemlocks and hardwoods which help to keep its waters cool, on this day they were 62 degrees. The fly chosen first was a dry. It soon brought a fish to the surface, several as a matter of fact but not a hookup. These brookies were small but spunky. Crystal clear water, a brook trout can be seen coming off the bottom for a dry fly. Moving on to the second stream I also found a good flow along with cool water. In one pool a rise was observed, I suspect it was an ant or a beetle. I tied on a black ant and soon found out that was the right choice. This beautiful brookie, in great condition was at hand. Moving along the stream I came to this pool. I have never taken a trout out of here and was convinced there were never any in here until my brother-in-law John took a nice brookie here back in the spring. I figured it was deep, good flow and an undercut rock so maybe.....the ant was cast and nothing, a soft-hackle was cast and nothing even a shiny brass bead head could not bring a strike. 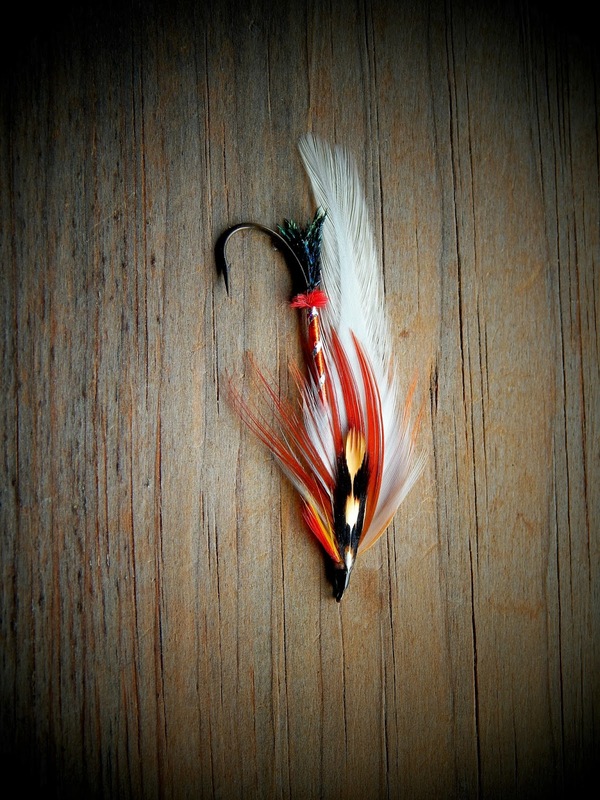 I then tied on a streamer, remembering that's what John was using when he took the brookie last spring. I cast the fly, by the way the little "Cane and Silk" 5 foot rod did quite well in casting the #10 featherwing. The fly landed on it's side and floated for a second until it was wet. As it began to sink I saw a dark shadow move to it, and then back away. I cast the fly again and began to strip the fly in. The strike came fast and hard, I knew I had a good one. In my last post I told you about the recent acquisition of the Cane and Silk fly rod. Well that was not the only new item that recently came my way. A reader of SSR's sent me a fly that was tied by a famous fly fisher from Pennsylvania by the name of Ed Shenk. 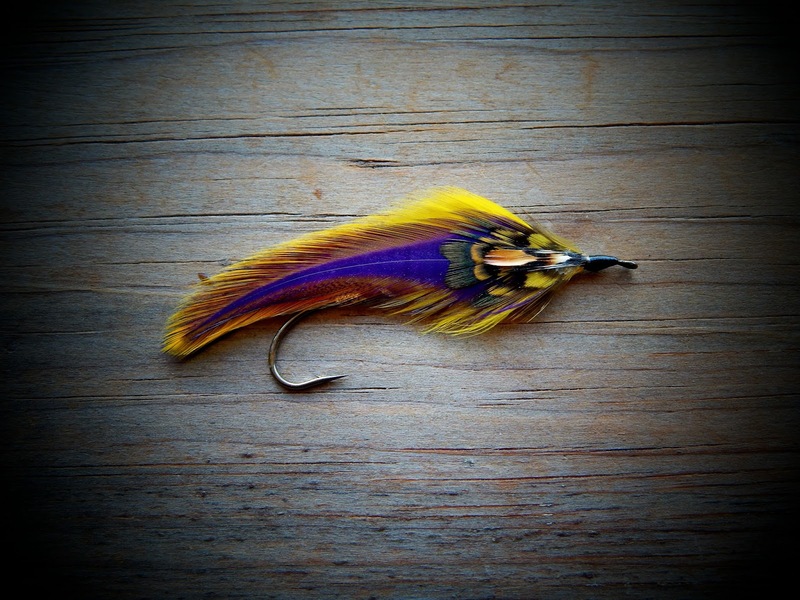 Ed is a master of the Letort river, an author and a world known fly tyer with many patterns credited to him. The fly that Brad sent to me was a cress bug. A simple pattern that's very effective, especially on spring creeks. One day last week I took the two new items to a stream and gave them a tryout, the first for both. In this deep pool the new rod and fly were to be tested. The water flows deep here especially near the left bank. If you look closely you can see brook trout holding there. I did not want to loose this fly so casting had do be done carefully and that's what the rod allowed me to do. The first cast spooked the fish scattering them. But a few moments later and a few casts and everything worked. This pretty wild brook trout hit that bug and the rod worked perfectly in bring him in. A quick photo and the brookie was on his way. The fly was snipped from the tippet and put in the fly box. It will be saved. The fly rod went on to take a few more fish before the outing was done. A good start I would say. I have been searching for a small fiberglass fly rod for some time and I have finally found it. I will introduce to you the "Cane and Silk" fiberglass rod. The rod is made in Pennsylvania by Mike Kathner. The rod is a "Hidden Water Series" designed for small streams. It is a 5' 2/3 weight 2 piece with a soft casting action. It's finish is beautiful and those little appointments are simple and elegant. The cigar shape cork handle is top grade and the sliding band reel seat holds the reel firmly. What a beautiful morning, the air was still and on the cool side. Getting out of the car I glanced across the field and was greeted by this sight. A few minutes were spent just looking. Thoughts of the day ahead were put on hold and it was so peaceful just to look. I have fished this stream and have learned well "not much"...it has taught me so much about brook trout that I didn't know, and I have learned well as long as I don't forget. One of the things I like to do is to try a different fly each outing. One fly that I have not used in along time. I know all of you have one of those flies tucked in your fly box. Well the fly I chose was Mr. Rapidan parachute. The fly is one that I picked up at Harry Murray's fly shop. It has a yellow post, yellow being the signature of all of the Mr. Rapidan flies. The fly was in the water and I would love to say that it worked very well but it did not. I fished that fly for a good half hour without a single rise. I fished it in several areas of the stream and decided a change was necessary. I tied on a Bomber and managed a few fish, "well at least they are still here" I said to myself. I had about an hour left to fish and selected a section of stream that has given up some nice brookies. It stream here looks harder than it is. Flies can be worked here but patience is the key, meaning don't rush, slow down your walk, your arm stroke, your pick off the water and the time you let your fly sit, either on the water or below. After violating three of my own recommendations, I finally got my act together. I tossed out a spider pattern and let it sit on the bottom. The fly was moved so slowly as I retrieved. I felt a subtle hit and set the hook. The fight was on. The brook trout collected enough stream vegetation a bird could have made a nest from it. All the while I kept pressure on him, seeing that orange color getting close I knew he would soon surrender. As my hand reached into the water the fish broke for freedom. I thought he had achieved it when I felt slack line. Pulling back I saw he was still on. Convincing him finally that I only wanted a photo I slid my hand under him and the photo was granted. Hook removed and off he went. The fly was not the Mr. Rapidan, but still one that I have not fished in some time. A simple spider...Thread body, peacock thorax, and starling hackle along with the will and patience to fish it like a natural. I had a request from a gentleman from the Pacific northwest for two patterns. They were to be tied in the Rangeley style. These patterns were of his choice. I hope he will find them to his liking. These streamers will remain east. These will be fished here in Connecticut, but they will also make appearances in a few other states. Because of there size they will be candidates for small streams. I just love this wing feather/color. It was from a cape I bought a few years ago. When purchased it was supposed to be gray, for gray ghosts...obviously it's not gray but what a nice color for a general minnow imitation. Dawn broke on a cool crisp day, a day when a flannel shirt was in order. It was one of those day's that refreshed all who faced it. I had my coffee and left the house early. I was hoping to get a glimpse of some wildlife in a field on the way to a stream. Upon arriving, and putting on my waders I met a couple of the landowners near where I fish. We chatted for a spell, they were happy to see some sort of resemblance of autumn finally making an appearance. As I entered the field to access the stream I was taken in by the colors of the goldenrod, that stuff is beautiful especially if you don't have allergies. I soon reached the waters edge, without seeing any deer, but there was plenty of signs that they were there earlier. Autumn in New England just beckons me to fish classic streamers. The bright colors of their feathers just seem to fit with the season. 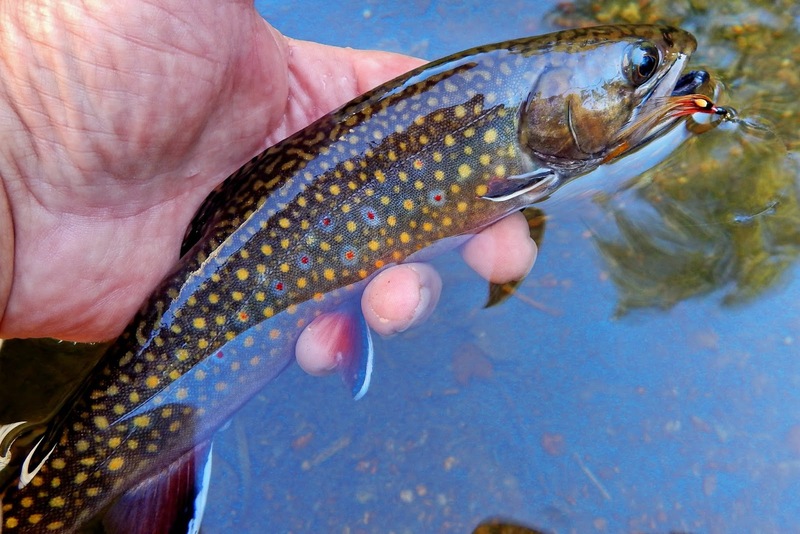 It is a time when brook trout are getting that call that comes with the shorter days and cooler weather to get ready to bring on a new cycle in their lives. At this time the males get pretty aggressive and a bright streamer gets their attention....this was such a day. There were some deep pockets along this stretch of stream. The streamer wad cast and worked back. After several tries I had a brook trout follow but backed down from a strike. Another cast to the side of the stream and the fly was stripped back across the stream and that's when the fish took. I could see the orange missile shoot for cover. I soon persuaded him to come my way. 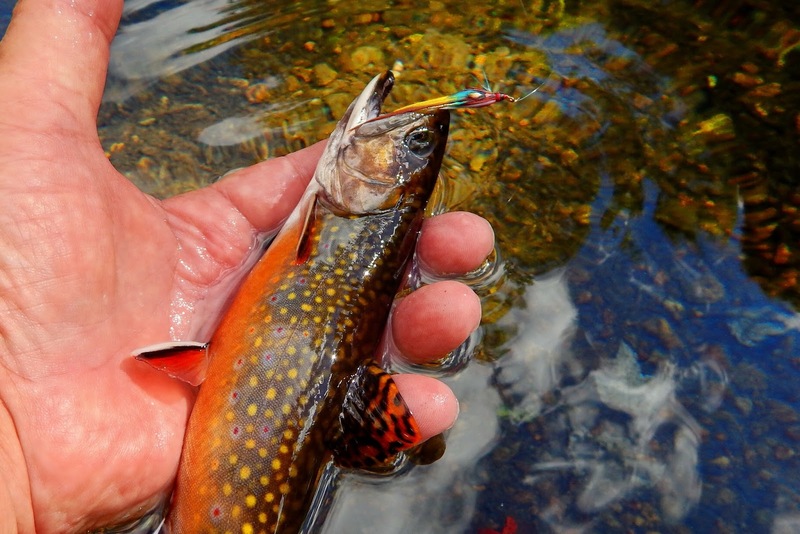 A beautiful wild brook trout taken on a classic New England streamer. What a day. This might be a little nuts, or I may be a little nuts for doing such a post, but here is the story. 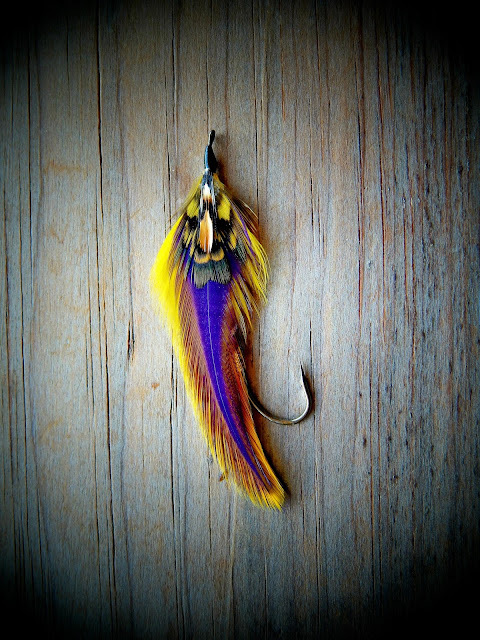 Long about 2008 I tied this streamer. I posted on several fly fishing forums, and a few web sites. It was also picked up by an international fly fishing site and published. 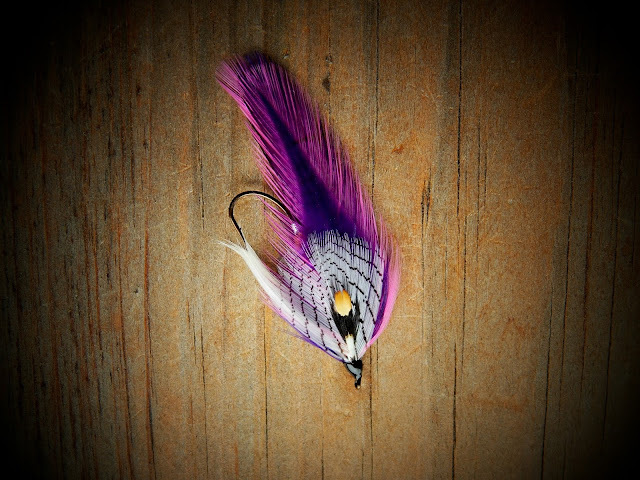 My offer is this...the first person who can give me the name of this streamer fly will win it. I have said many times that the brook trout is not an early riser. He is a fish that likes to sleep late and when he does wake he likes to just lounge along the stream bottom and quietly get his thoughts together on the day ahead. He is very similar to me in that regard and probably like most of us. Over the many years of pursuing fontinallis I have found that he will not actively start feeding until 8 AM, and that 10 until 2 are prime times to see him work the surface. Maybe that's why I like him so much, he gives me time for that second cup of coffee which I so enjoy. Arriving at the stream I found the water flowing gently. There were several stressed colored leaves floating along and I wondered what is the fall foliage season going to be like in this low rainfall year. As I stepped into the stream I could see brook trout racing for cover, a good sign and a bad sign. The bad sign they were aware of me the good sign they don't stay scared to long. I moved upstream kicking up the bottom and sending clouds of silt downstream. I found a nice looking place to stop and looked over the stream. I chose to wait out the silt storm and looked about the forest on either side while figuring out my game plan. I tied on a fresh piece of tippet and a dry fly and was ready to work the stream. It was not long before I had a willing player. A beautifully colored brook trout was at hand. I was fortunate to take several more during my few hours. As I started working my way back to my starting point I spooked a couple of nice fish. They scooted downstream in a hurry. I stopped and decided to wait and see if they would return. Some minutes later I sent the fly on a drift, there was no response, I repeated this a couple of times with the same result. They did not return, and I started walking again and then I spotted the fish. He was lying just in front of some stream vegetation. I cast the fly and saw the fish move to it and take. He took that fly all over the stream, in the process he created his own silt storm. I even enjoyed a leap from him before he was at hand. A wonderful wild creature, a native, and a true blessing taken on a dry fly. Thanks friend. This is another streamer with a Maine inspiration. Years ago we stayed at a camp on Mooselookmeguntic lake. With the camp rental there was a Boston Whaler that could be rented. We would take the boat out early mornings and troll the lake with Mooselook wobblers, and large trolling streamers. One of the favorite places to fish was Bugle Cove. We would start there and troll to Farrington Island. We would take our share of salmon and a few brook trout. Along the shoreline of Bugle Cove was a camp named "Windswept" and named so because of the winds which at times were like a gale. That camp name stayed with me and it was about 2008 when I tied this Rangeley Streamer. I have not tied a streamer in some time, so the other day I sat down to tie one up and present it to you. The streamer is "John's Pond" and it's named after a beautiful area in the western Maine mountains. John's Pond is located among fir trees and birch and it's trails and mountains have been walked by me many times. The streamer is tied in the Rangeley style and it captures the beauty of the area. The ingredient list if you would like to tie "John's Pond"
Ed Hewett's Neversink Skater...here are a couple of them tied as close to the originals. They are tied on number 14 and 16 hooks with some very large hackle. Now that they're tied I was obligated to see just how they would fish. In the back of my mind the thought was they were going to flip up and not look very appealing to the trout, but to my surprise they landed just fine for most of the time. Yesterday was a cloudy day and that was a blessing as it helped me move a little easier without getting spotted, at least that's what I thought....man are brook trout cautious. As I finally busted through the wall of briars and reached the stream. There were parts of darkness and parts of light. I tossed the thermometer into the stream the reading was a cold 56 degrees. This stream is one of long pools some of which are deep, and then sections of riffles. There are undercuts all over, some caused by the stream banks, and some of thick brushed bank side foliage. It was in these pools that I first floated the Skater. The cast was made and the big fly could be seen just barely moving in the slow current. The fly made its drift with out a strike. Several more casts and the same result. I then let the fly drift to a likely holding spot and let the fly just sit. About 10 seconds later I just twitched the fly and an underwater explosion took place. I could see the brook trout racing from side to side frantically trying to toss the Skater. I was to win out this time and as I slid my hand under his side I was able to lift him and capture his beauty. I could see trout holding in center stream but when they felt my threat they took to the thick stuff along the banks, and that's where I tried to place the skater. Most times that action worked. The Skater required lots of time to dry, especially after a few fished were hooked, I had several so that was not a problem....the problem is getting a fly box big enough to hold the large flies. A very interesting run, a little bend, lots of cover and quite deep. Looks like a place that may hold a fish. This time it did not take several casts to locate the resident. As soon as the fly hit the water it was beaten down in splash of of water. I could feel the heft of the trout and glancing at the rod I knew he was a good one. That fish moved all over that stream and jungle, staying to the bottom for the most part. When I gained the upper hand and managed to bring him alongside of my leg I realized I had a real small stream beauty. The beautiful male just starting to show his fall colors was a highlight of my day...the other was Hewett's Neversink Skater.